I have that book! And generally like the author, but my first reaction to the cover was: ‘That’s so 80”. The cover almost prevented me from buying the book truth be told. Welcome Back My Friends, To The Show That Literally Never Ends. This picture was apparently taken during an earlier set than the one from Carnelians. His shirt is still intact. Joseph and the Amazing Technicolor Dream Shirt? Well, this picture explains why his shirt was wrecked in the last one. Never sing while standing too close to lasers. All I see is a Spacemanilow. @Rodney C. Johnson: I like the author too. My only beef is with the cover. Spacemanilow? As a huge Barry Manilow fan I don’t see that at all. Obviously that’s suppose to be Neil Diamond. It’s even up there in the title. The Sixth Doctor starts his floor show. I thought he was a Las Vegas sword-swallower. @Jami: Come on! That shirt is pure Copacabana! Allow me to be the first to point out, then, that the FRICKIN’ LASER BEAMS HAVE SIZZLED OFF HIS FIFTH LEFT FINGER! It’s heartening to know that even people in far futures and alternate universes still have to put up with crappy music. @Smith – Nah. That shirt is pure 70s Neil Diamond. Pants and belt too. Plus the hair looks a lot like his hair on Greatest Hits V 2. Hey, I like Neil too, not as much as Barry, but I do enjoy his music. Especially Brother Love’s Traveling Salvation Show. But that cover is SO Neil. @Jami: I guess it just shows that cheesy pop, like mathematics, is universal. Is that supposed to be a belt? Or has he inadvertently picked up a series of symbiotic space leeches that grant him sparkly powers? Appropriating this for “Look at all the fucks I give” memes. 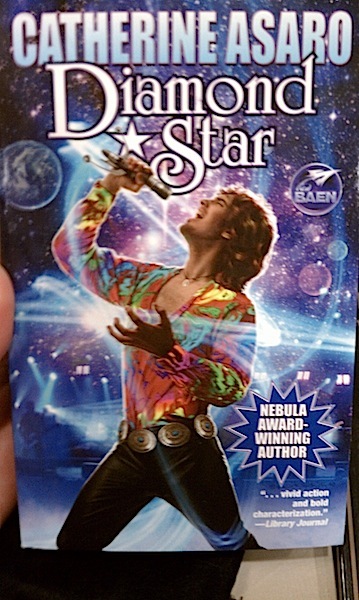 Is this a disco version of “Rock Star”? @Phil: You could be right, but then that’s a light saber. I’d pay to see that. @TagWizard: This and the other Asaro cover require the new searchlight tag. Do spotlights count as searchlights, even in Future Space Neil Diamond World? I hate to disagree with everyone but that is clearly Keith Partridge. The rest of the family is hidden behind that shuriken of approval. Seems a little too blond for Keith. It does seem like the sort of outfit/gig his manager would book. Leif was made for dancing, not singing, as his records attest. Apart from that time he collapsed in a UK nightclub. Maybe he wasn’t made for dancing either. It’s the future. Perhaps he’s some unholy genetic mashup of teen idols/pop icons throughout the centuries. As the Carnelians link above doesn’t seem to work, here’s the mirror-image http://www.goodshowsir.co.uk/?p=4904 and my comment at the time stands: it’s Tom Cruise in ‘Rock of Ages’. Hang on, how did he go from 70s teen/pop idol* (this, 2010) to Tom Cruise in a year (Carnelians, 2011)? I know life on the road is tough, but it doesn’t change people that much. That is NOT the same person as the other cover, even if the wardrobe and pose are. *Also looks like a smidge of “Frampton Comes Alive” thrown into the genetic mix in this picture.